I hadn't eaten KFC for years and years, until a week ago when I was invited to go along to HQ of KFC in Woking for a behind the scenes tour. We were fed with chicken, fries, salad and ice cream until we almost burst . We also got to try a few new KFC menu items that are to remain top secret until the launch later on in the year. This was followed by a trip to an actual restaurant to fry some chicken! I say 'we' because of course it wasn't just me, there were a couple of other bloggers, Heidi of Kitchen Talk and and Chris from TikiChris. KFC is part of Yum International - the corporate group that owns KFC, Pizza Hut and Taco Bell. 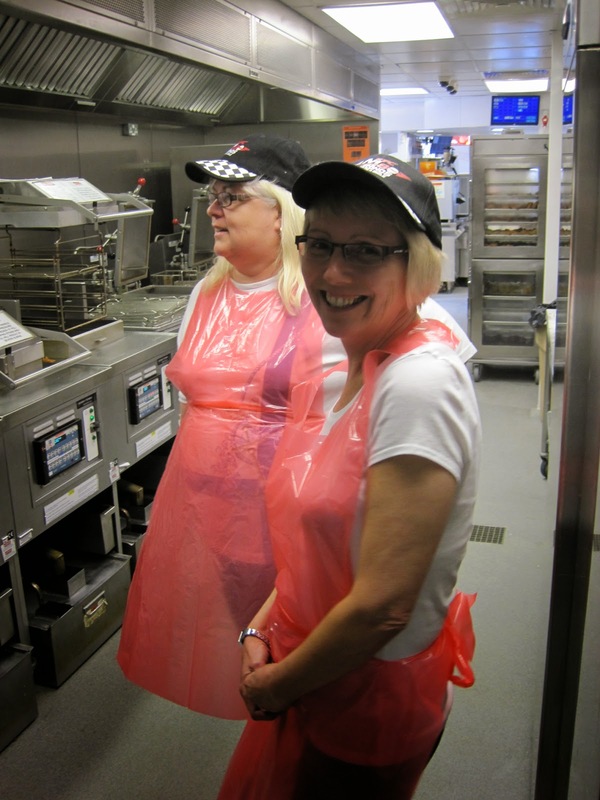 Not sure where Chris was at this point but this is Heidi and me in the KFC kitchen. Television three-part documentary Inside KFC is to be shown later in the year. The BBC were there too, filming our day as part of a documentary they are making about KFC which will be shown later on this year on BBC One. Our day started with introductions to Mark Baxter Operations Innovation Manager KFC UK & Ireland and Jenny Packwood, Head of Communications & CSR KFC UK & Ireland. Mark invited us to ask any question we wanted about welfare and nutrition etc. Personally I felt that Mark answered every question thrown at him (apart from letting us in on the secret famous blend of spices of course) he was honest and there didn't seem to be anything he didn't know about the brand from farm to fork. First up was the question of Welfare and does their Chicken come from the UK? The answer is all of KFC's bone-in chicken does come from the UK, and is sourced from Red Tractor certified British farms. KFC chickens are raised in a “natural enrichment” environment which basically means they have access to natural light and live in a setting that’s designed to minimise stress for the animal. But the fillets and mini fillets have to come from other countries in the EU and as far away as Thailand and Brazil. Mark gave a really honest answer and explained why - it's to do with the size. Now I can't remember the actual figures but of course each and every day thousands are needed to supply not only KFC of course but supermarkets, butchers, schools and restaurants. 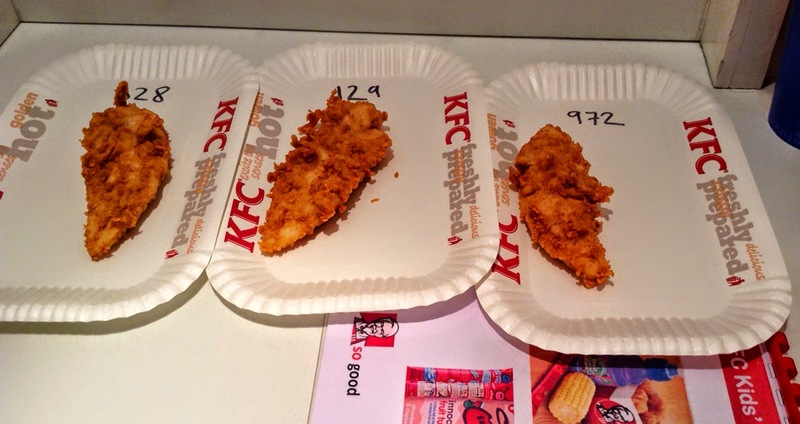 Basically KFC need a certain size chicken or they wouldn't be able to get them all cooked perfectly at the same rate which of course for 'fast food' they obviously aren't able to cook each piece individually. Of course since most supermarkets are looking for a similar size this leads to a shortage of chickens being available if they were to source from the UK alone. We then watched a short video of a KFC chicken farm 'Moy Park Farm' in Lincolnshire which supplies chickens for KFC. We all agreed the chickens looked happy and had much more room than we thought they would have. The place looked very clean with some natural daylight, clean floors and fresh drinking water. How Can you Guarantee the Welfare of the Chickens coming from abroad? As it turns out Mark had been asked this question so many times and so to find out for himself, he went to Thailand to the actual KFC chicken farm and he made a short film, which we watched. What about Nutrition, Fat and Salt in their Products? KFC are committed to lowering salt in their products and have done so, although it's still ongoing to get it even lower. Time for The Taste Test - We were then taken off to a room and sat in an individual cubicle. A sliding door opened and someone pushed through three mini fillets each numbered - two of the fillets were the same but one was lower in salt. Now, each of us believed we'd spot the difference with no worries - but we were wrong. It was so hard to tell the difference. 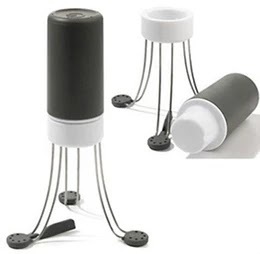 Personally, I think most food manufactures are a little bit stuck sometimes because if they take all the salt out, the food will taste bland and wont sell. KFC have committed to stop using palm oil to cook but instead use a rapeseed/sunflower oil blend. They have a fantastic range of kids meals offering corn cobette or baked beans instead of fries. The kids menu shows dietary information for each meal. They can choose to have an fruit tube for dessert or a yogurt instead of a sundae. Is any of KFC's meat Halal? The answer is - KFC currently sell halal chicken in around around 90 or so restaurants around the country but we continue to insist that poultry is stunned before slaughter. We only buy high quality, Grade A, farm-assured chicken from trustworthy suppliers, who are contractually required to meet or exceed all relevant UK and EU legislation and this will not change. There will be no compromise in the welfare standards of animals whatsoever. What did we eat throughout the day? First up was a platter of chicken fillets coated in Original KFC, BBQ Rancher and Zinger. Still my favorite is the original. 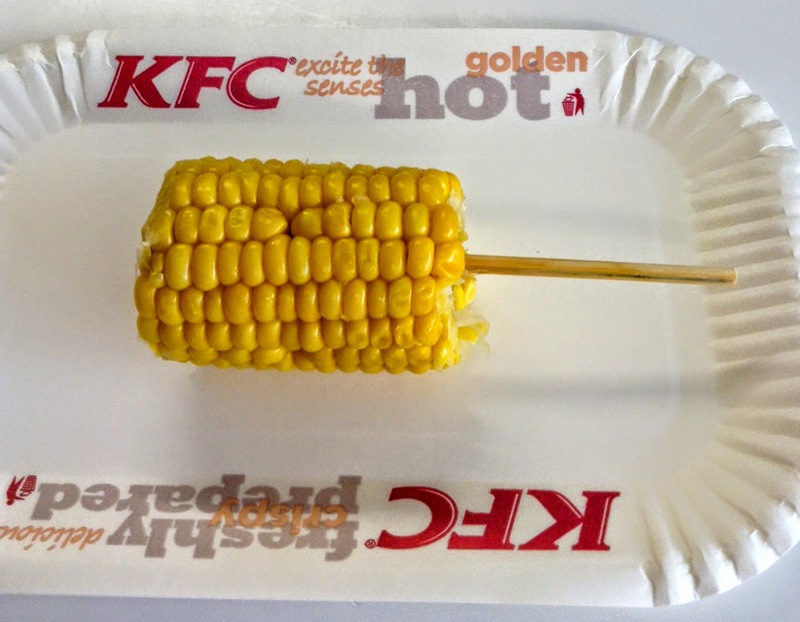 Supersweet Corn Cobette - The sweeter variety used now allows the removal of a butter dip that was served in the past and therefore reduces calories by 60 Kcal and is less messy to eat. The cobette was so good to eat and because it is steamed in the oven and retains all the goodness and really does taste amazingly sweet and tender. 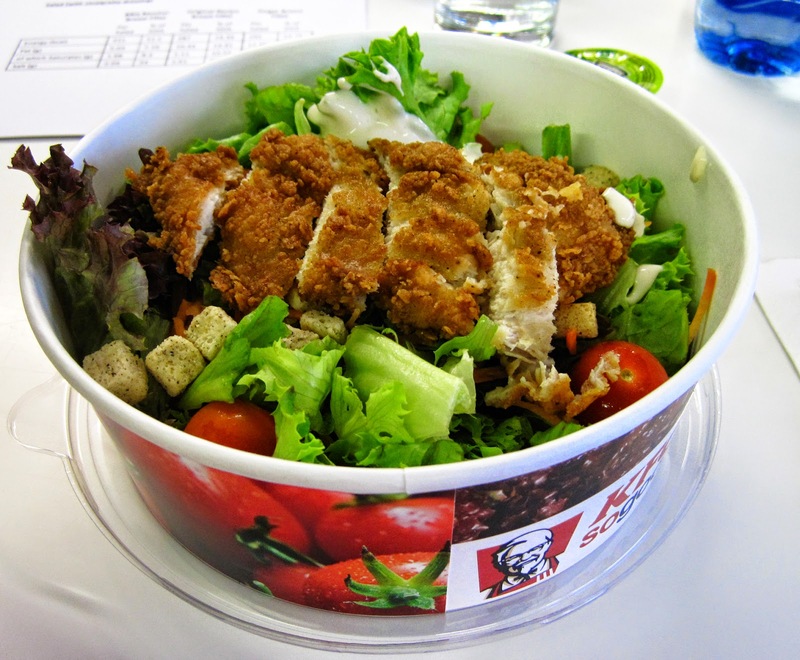 KFC 'Sogood' salad was next up (we were already getting full by now) I chose Original Recipe Chicken Fillet and a Caesar dressing - a Vinaigrette dressing is also available. The 'Sogood' salad range was initially launched in 2004 but having been relaunched in 2012 it has become a popular choice especially at lunch time. The tasty salad was followed by trying some new and very 'Top Secret' products so I shall have to keep that to myself at this time and yes we were really full by now! But it was time to taste the Millionaire's Shortbread Kream Ball which is a big portion of real dairy ice cream with chocolate and shortbread pieces, topped with a caramel sauce. Time for a ride in a minibus to a KFC to fry some chicken! Yes here we are with our KFC caps and all scrubbed up with the BBC in tow. I have to say I am seriously impressed with the cleanliness of the kitchen and the control they have over food thats cooked to ensure that any cooked chicken that hasn't sold within a set time is removed from sale and destroyed. In this picture a member of staff explains this and how the monitor shows what's cooked and how long it has until it is either sold or binned. 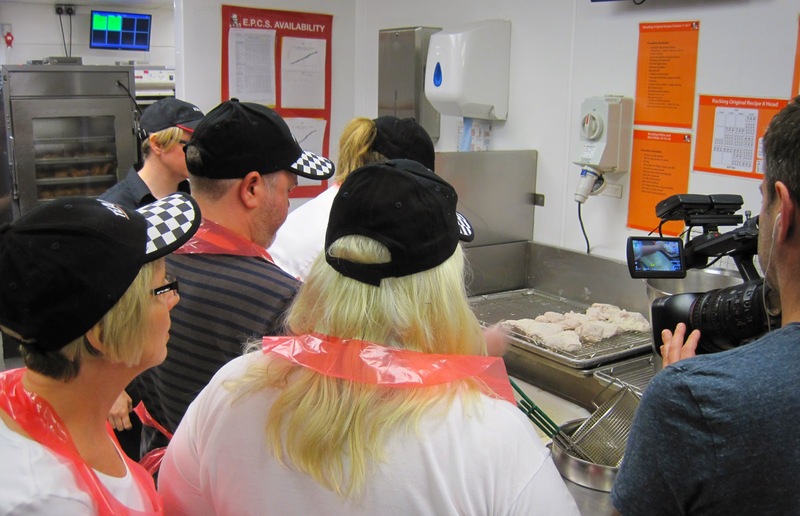 Here we are watching the chicken being prepared - yes the chicken is prepared and coated in the restaurant as needed. It doesn't arrive prepared as I assumed it did. Then another wash and scrub before taking the chicken to the fryer. A pressurised fryer (a bit like a pressure cooker but with oil) was a scary looking piece of machinery indeed. Chris had a go at coating and frying some chicken but me and Heidi both chickened out - ha ha. Sadly I don't have anymore photos as it was far too tricky taking pictures with the BBC there. Not to fuss, I think you can see we had a fantastic day but they still hadn't finished feeding us - there were fries coated with the original spice mix that were delicious and a big bag of KFC chicken! The day has definitely changed my mind on KFC and I would eat there again. The food is much more healthy than it used to be years ago. I'm really impressed with the high standard of quality control and hygiene and I'm satisfied that the welfare of the chicken is being maintained to a good standard. Thank you to KFC and their staff for an absolutely fantastic day. Disclaimer: My train fare was paid by KFC and we were fed till we well and truly full. I also received a voucher to spend at KFC. All thoughts are my own and I was not required to write a positive post. I've been asked to do this day twice now and have been unable to go either time. Hopefully the next time. I am really impressed at KFC opening their kitchens and being so transparent like this. A really interesting post. Just the sweetcorn for me, but it was interesting to see behind the scenes. Good for them for doing that. I do love a KFC burger - my favourite pit-stop on a long motorway journey. Great to see an open-door policy here for bloggers. Looks like an interesting day out. 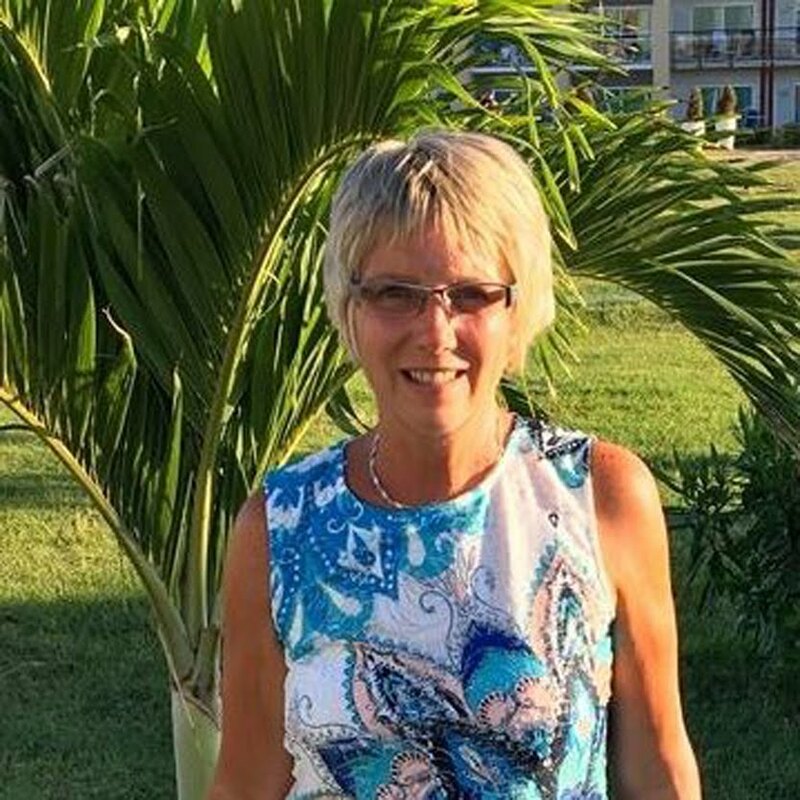 Michelle and I really enjoyed our day at KFC and were impressed by how open they were about answering all of our questions. I think the food is really good quality, but we rarely eat there as a family as they don't offer a vegetarian burger/main meal option which is pretty poor! Sounds quite interesting, will look out for you on the telly Jan! I have to admit I do love a KFC every now and then. I especially love the gravy! Although I have to admit I haven't had one for a year or two after a really greasy one put me off! I do miss the gravy!